Extraterrestrial cyclones are cyclones found on other planets or natural satellites other than the Earth. Venus has two large long-lived pairs of inverted anticyclones, one pair near each pole (polar vortices), discovered in 2006 by the Venus Express probe. Venus's southern pole vortex is the size of Europe and starts at the lower clouds of its atmosphere (42 kilometers from the surface) to the upper clouds of the atmosphere (63 kilometers from the surface). The vortex's elements are constantly being broken apart and coming back together as the vortex circles every 2.2 days. "The vortex is never destroyed, but it evolves continuously between morphologies" or shapes, Garate-Lopez said. Two centers of rotation of the 12-mile-high (20 kilometers) storm, which exist at different altitudes, rarely ever line up. On April 27, 1999, a rare cyclone 1,100 miles in diameter was detected by the Hubble Space Telescope in the northern polar region of Mars. It consisted of three cloud bands wrapped around a massive 200-mile-diameter (320 km) eye, and contained features similar to storms that have been detected in the poles of Earth (see: polar low). It was only observed briefly, as it seemed to be dissipating when it was imaged six hours later, and was not seen on later imaging passes. Several other cyclones were imaged in about the same area, like the March 2, 2001 cyclone, 19 January 2003 cyclone, 27 November 2004 cyclone (Dust devils have also been observed on Mars.) Snow was detected in the sky on Mars by Nasa's Phoenix Mars Lander, however, the snow vaporised before contacting the surface. Great Red Spot, with Oval BA to the south. The Great Red Spot on Jupiter is, by far, the largest extraterrestrial anticyclone (or cyclone) known. It is so large that about 2 to 3 Earths could fit inside it. The Great Red Spot has existed on Jupiter for at least 340 years. In the image at the left, the Great Red Spot can be seen near the top center. The Great Red Spot has turned dull pink, to bright red, but has not yet dissipated and is not likely to do so in the near future. Oval BA (or Red Spot Jr.) is a remnant formed from the merger of multiple white ovals. It is located just to the south of the Great Red Spot and has been increasing in strength. The Great Dark Spot is a feature observed near Jupiter's north pole in 2000 by the Cassini–Huygens spacecraft. 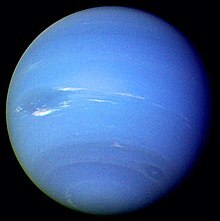 A feature in the atmosphere of Neptune was also called the Great Dark Spot. The latter feature, imaged by Voyager 2 in 1989, may have been an atmospheric hole rather than a storm. It was no longer present in 1994, although a similar spot had appeared farther to the north. False color image of the Dragon Storm. On October 11, 2006, the Cassini-Huygens spacecraft took images of a storm with a well-defined distinct eyewall over the south pole of Saturn. It was 8,000 kilometres (5,000 mi) across, with storms in the eyewall reaching 70 km (40 mi) high. The storm had windspeeds of 550 km/h (340 mph) and appeared to be stationary over Saturn's south pole. In addition, several storms like the Great White Spot occasionally appear on Saturn's northern latitudes, becoming large enough to be spotted by telescopes on Earth every 28 and a half years. There is also a long-lived storm known as the Dragon Storm, which flares occasionally on Saturn's southern latitudes. A hexagonal cyclone in Saturn's north pole has been spotted since the passage of Voyager 1 and 2, and was first imaged by Cassini on January 3, 2009. It is just under 15,000 miles (25,000 km) in diameter, with a depth of about 60 miles (100 km), and encircles the north pole of the ringed planet at roughly 78° N latitude. On June 27, 2012, before a distant flyby of Titan, Saturn's largest moon, the Cassini–Huygens spacecraft took images of a vortex over Titan's south pole. Titan has a visible hood high above the north pole consisting of denser high altitude haze compared to the rest of the moon's atmosphere. The formation of the vortex at Titan's south pole may be related to the coming southern winter and the start of what will be a south polar hood. Scientists think the images obtained in this flyby show open cell convection. In open cells, air sinks in the center of the cell and rises at the edge, forming clouds at cell edges. However, because the scientists can't see the layer underneath the vortex, they don't know what mechanisms may be at work. A more recent observation of the south polar vortex led scientists to conclude that it has formed at a much higher altitude than previously thought. Starting in 2006, dark spots like those on Neptune were observed on Uranus as the planet approached its solstice in 2007. Wizard's Eye, the smaller storm that looks like an eye, can be seen near the south pole. The Great Dark Spot on Neptune is a series of anticyclones (possibly atmospheric holes, similar to the ozone hole) first discovered by Voyager 2 in 1989. It was then approximately the same size as Eurasia. The Wizard's Eye (sometimes called Great Dark Spot 2) is another cyclone on Neptune. It is about one-third the diameter of the Great Dark Spot. It received the name "Wizard's Eye" because it looks like an eye. This appearance is caused by a white cloud in the middle of the Wizard's Eye. ^ Phillips, Tony (March 12, 2003). "The Great Dark Spot". Science at NASA. Archived from the original on 15 June 2007. Retrieved 2007-06-20. ^ Nemiroff, R.; Bonnell, J., eds. (13 November 2006). "Information about the Dragon Storm at NASA". Astronomy Picture of the Day. NASA. This page was last edited on 20 May 2018, at 10:00 (UTC).